Tennis player careers can often be divided into two phases - that is, the period before they leaped into greatness and the second phase: all that came after. For today’s birthday boy, 36-year-old Roger Federer, the major moment happened not after he beat Pete Sampras at Wimbledon in 2001, but a year later, when his coach, Peter Carter, was accidentally killed. Carter’s death jolted Federer and made him see that the time had come to capitalize on his considerable talent. Having never previously reached a Grand Slam semifinal, within a year, Federer had won his first Wimbledon. Pete Sampras, who turns 46 this coming Saturday, had already won the 1990 US Open when he saw a new path. Upon losing the 1992 US Open final to Stefan Edberg, Sampras realized he hadn’t given his best possible effort - and that, most of all, these Grand Slam finals were incredibly important. The loss to Edberg haunted Sampras. By 1993, he’d reached the world number one ranking and that same year won his first Wimbledon and second US Open. My Tennis Channel colleague Martina Navratilova had already won two Wimbledons and been number one in the world when, in 1981, she recognized it was time to upgrade everything from her approach to fitness to her technique. The next year, Navratilova commenced a dominant five-year stretch that saw her win 70 of the 84 tournaments she entered, including 12 majors. And now, we have Alexander Zverev, 20 years old and likely on the precipice. At the end of 2015, he was ranked 83 in the world. Just over 18 months later, Zverev is ranked eighth. He has won four tournament titles this year, most recently taking the Citi Open in Washington, DC. It’s indeed a special moment for Zverev, a pause of sorts in the tale of a man who will soon be playing only his third US Open - and also, a man who has yet to reach the quarterfinals of a major. There remains about him that strong smell of tremendous opportunity - and also, to Zverev’s credit, an absence of the jaded sensibility and resentment for the tennis life that can infect a pro at any stage (just ask Nick Kyrgios or Bernard Tomic). 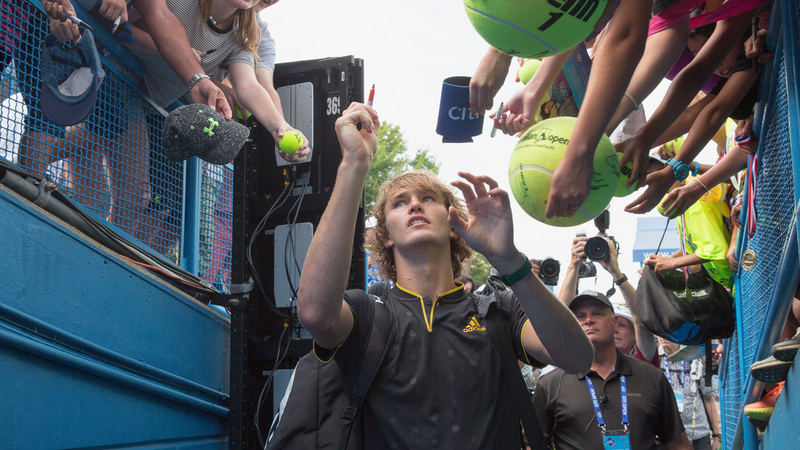 For Zverev, will the journey continue to flow smoothly? What moment will propel him to his next big direction? Tempting as it is to impose a timetable on Zverev - such as reaching a Slam quarter by the end of 2018 - that approach is an external narrative, not necessarily of concern to the player. Or is it? There also are those rare supernovas - Chris Evert, John McEnroe, Martina Hingis - who quite early and rapidly burn bright. Evert reached the US Open semis while in high school and within two years had played two major singles finals. McEnroe made it to the final four of Wimbledon before he entered college. Hingis won three singles majors before she turned 17.